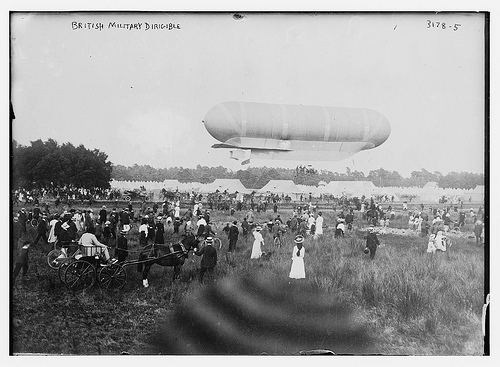 The end of the 19th century saw a great spark of interest in the airship in countries like Germany and France, the British lagged behind somewhat though quickly caught up in the early 20th century. R101 apart not much is often written about British airship developments compared to the likes of the zeppelins which makes Ian Castle's book British Airships 1905-30 in the Osprey New Vanguard series most welcome. As with all NV books it is a fairly slim tome but packed full of information and well illustrated. The book tells the story of British airships from the first non-rigid ships through to the disaster of the R101 which pretty much ended British interest in the airship (for the time being anyway). The book describes each Army and Navy airship series in turn and describes their wartime exploits. The book concentrates on the military role of Britain's airships so does not go into great detail about the R101 but that has been amply covered in other books. What is particularly interesting is the coverage of early British non-rigid airships such as the rather lovely looking flying sausage Nulli Secundus. The only flaw in the book is that it is rather short (only 48 pages) but that is a common problem with the Osprey NV series. The structure is also a little illogical, the airships are described first and then the book goes back to cover the war service. It may have flowed better to do this at the same time. These are only minor niggles though, it is a lovely book that is highly recommended.